For the past few weeks I’ve been writing a weekly open letter to readers about what I’m seeing across the stock market, bond market, commodities and currencies. The feedback I’ve received has been unlike any other time in the 5 year history of All Star Charts. I want to thank all of you for that. I think this is something that I will have to continue to do and make it a regular part of my routine. I’ve done this sort of thing in the past while managing money in order to keep our investors up to date on how we want to approach the marketplace. The format you’re seeing here is no different. Please feel free to keep emailing me and contacting me via Stocktwits or Twitter on how it can improve and what sort of things you guys want me to talk about. Is This Really A Big Week For Treasury Bonds? I’ve noticed a lot of extra noise out there regarding this week’s FOMC meeting. I’m generally in the camp that the noise gets louder sometimes in order to help sell ads and increase page views and not necessarily because one particular week is any more important than another. I try and let supply and demand dictate my actions rather than a specific event like an Apple announcement or a Yellen speech. If you’re a day trader trying to anticipate or fade knee-jerk reactions, that’s fine. But for us that look out weeks and months, this is all just noise that we want to avoid at all costs. They make for great headlines, but it’s not for us. 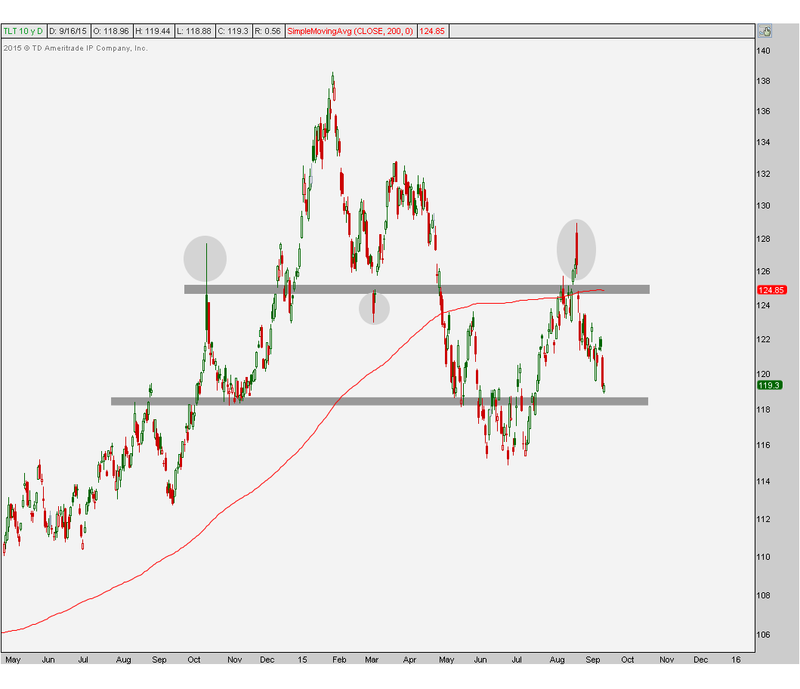 As far as U.S. Treasury Bonds go, the one I get asked most about by readers and subscribers to our research is the infamous TLT. It’s by far the most liquid ETF out there and represents the longer end of the curve, so it makes sense. We’ve been in the camp over the last 6 weeks that Bonds are a no touch (See here: August 6, 2015). Our upside targets were hit after being bullish since early June so I figured we’d back off at let it digest those gains. I especially hated prices approaching a flat 200 day moving average. Long time readers know how much I hate that. Price near a flat 200 day creates headaches that we simply don’t need. Here we are back down to this level. The problem that I still see is the overhead supply. $125 has been support and resistance since the 4th quarter last year and the whipsaws above and below it led to key reversals. The market respects this level and so do I. This also happens to be where we find a flat 200 day moving average that suggests a lack of trend. Sentiment-wise, Treasury bonds are right in the middle so we’re not seeing any extremes there either. For now I think we’re still stuck in this range. The lack of trend suggests fading the upper end and covering shorts or putting on tactical longs at the lower end. Of course this all depends on your time horizon. Are you looking for a trade to put on for a few hours or days? Or are you looking out weeks and months? I’m more of an intermediate term guy, so for me the lack of trend suggests continuing to stay away bigger picture. For shorter-term market participants, trading the range seems like the best bet from here. Click Here to receive weekly updates on each of these charts including interest rates, S&P500, Dow Industrials, Russell2000 and other U.S. major stock market indexes.